Due to evolution of economical environment, new payment means acquire more and more value. Cryptocurrencies had appeared as an alternative money functioning system and it was caused by the lack of financial freedom on the one hand – and deficit of transparency between people, whose deals were not protected by official financial establishments, on another. Solving these problems, cryptocurrency became the most influent economic phenomenon of the last decade. Special program codes, named Smart Contracts, allowed common people to establish transparent financial relations as individuals and stay aside of traditional banking systems. Increasing popularity of the blockchain technology led to development of the full-fledged cryptoeconomy ecosystem. At the moment cryptocurrency is no longer just a means of payment – there are more and more projects, which offer new solutions for economic, social, scientific and other human activities. Nevertheless, cybercriminals continue stealing millions of dollars from people’s accounts – through scamming web-sites, hacking exchanges and wallets, substituting transaction addresses. Besides, transaction fees sometimes reach really impressive sums. As well as any ecosystem, blockchain ecosystem has it leaks. And to improve main of them SONDER Project was created. The first sphere, where cryptocurrencies should be used as payment means, is e-commerce market, which occupies a huge niche in modern world economy. Value of large electronic marketplaces is calculated in billions of dollars. It’s obvious, platforms for purchasing goods and services on the Internet offer a lot of benefits for customers, but the issue of simple implementation of cryptocurrency payment services into online-stores is still unsolved. Simple process of adjustment of blockchain payment services for e-commerce platforms will undoubtedly lead to their mass adoption among electronic marketplaces owners. To reach this goal we are developing the package of API and SDK tools. Application Programming Interface will provide opportunities to connect Sonder Payment system to trading platforms easily and configure it to their own features. Programmers wouldn’t have to spend a lot of time, writing down endless codes to make payments in cryptocurrency available for online-stores consumers. All that will be required for this is to use ready-made Software Development Kit and adjust it for the certain marketplace. When SONDER Payment system is fully developed, acceptance of payments for purchasing goods and services on the Internet with cryptocurrencies will become as fast and easy as with fiat money. SONDER Project is aimed to overcome the main barriers to full integration of blockchain-technologies into e-commerce market – high transaction fees, low speed and lack of transparency. Just imagine if you want to pay with Bitcoin for your morning coffee, you would have to wait five-ten minutes or even more till transaction will be confirmed. For this time your coffee price can increase for some dollars and, besides, waiting is always annoying. Another problem is when you buy any cheap items on the Internet, sometimes transactions charges exceed the price of the purchase. Is it clever to pay 20$ of fees for pizza, which costs 15$? Don’t think so. Immediate execution of transactions in Sonder Network will be achieved due to fast speed of forming blocks and consensus between the masternodes. Besides, implementation of PoS will allow to reduce transactions fees to minimum. As the network is incredibly light, the cost of nodes’ operations is practically worth nothing. After SONDER Mainnet is live, purchases on the Internet with SNR-tokens will be available almost without charges. Providing fast and cheap microtransactions, we are going to turn cryptocurrencies into really competitive payment means for everyday life. There are a lot of ways to secure your funds from undesirable encroachments – desktop wallets, 2FA authentication systems at exchanges, cold storages etc. But the most efficient strategy of achieving absolute security level can be realized through hiding any information about your balance status and transactions history from strangers. 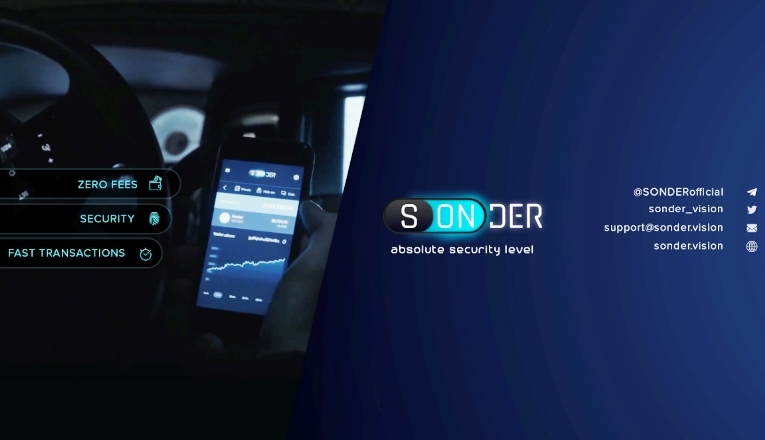 There are a lot of privacy coins, represented on the market, but their main goal is to make your deals anonymous, while SONDER is aimed to guarantee absolute security of payments. Team has been developing a number of technical decisions for achieving the highest standards of true privacy. Some of them will be implemented in the multifunctional Sonder Wallet with an optional anonymous mode and mechanism of obfuscation of addresses. Enabling this mode, people will be able to hide any information about their balances status and disguise transactions addresses from prying eyes. Nobody will steal your money, if he wouldn’t know you have them.